His father had been a ‘Boots’ and later a cellar man at the Manor Hotel, but by 1911 he was working as a carman (cartage staff) on the London and South Western Railway. 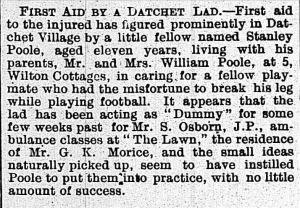 There were a couple of articles in the local newspapers of the time which reveal a little more about the family. 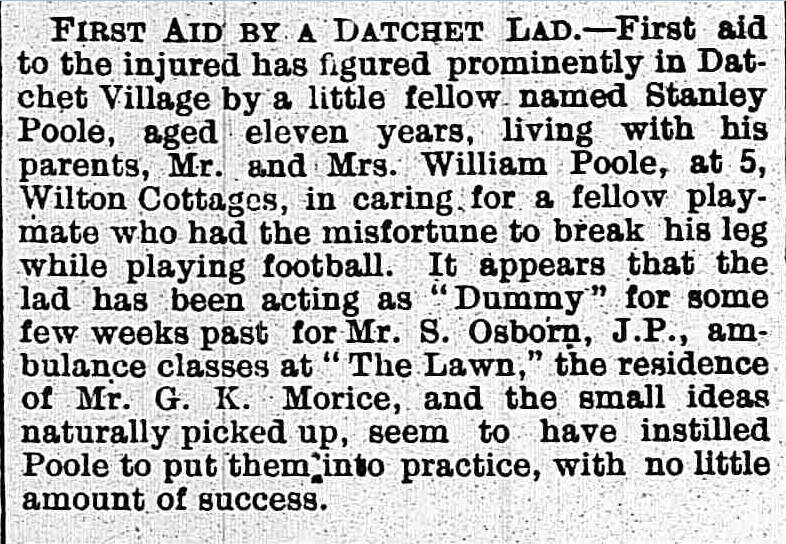 In 1906, Will’s brother, Stanley, was praised for his quick thinking in providing medical treatment for a fellow footballer. It transpired that he had picked up some useful first aid knowledge while acting as a patient for ambulance classes held at The Lawn. And in September 1898, Will’s mother’s name appeared in the Slough Eton & Windsor Observer when she and others complained about the noise made by the Salvation Army in Green Lane every Sunday and asked for their “quietude and rest” to be protected. Will had enlisted in Slough before the war. In 1911 he was serving in Ceylon and India as Gunner 50149 in the 82nd Battery, part of the 10th Brigade Royal Field Artillery, 6th (Poona) Division. The 82nd Battery RFA was in Kirkee (Khadki) India at the outbreak of WWI. They received orders to mobilise on 9 September 1914 and sailed from Bombay on 8 November 1914 aboard S.S. Torilla. They disembarked at Saihan eight days later and served in Mesopotamia, helping to protect Britain’s oil interests. In 1915, buoyed by a number of early successes, including the capture of Basra and Qurna, a decision was made to advance on the Mesopotamian capital of Baghdad. The 6th Division advanced upriver, leaving a thinly-stretched supply line of hundreds of miles behind it. They were halted by the Ottoman forces at Ctesiphon, on the western bank of the Tigris, in November 1915. After two days of hard fighting, they withdrew to Kut-al-Amara where their commander, Major General Townshend, decided to hold the city. The Ottomans, who had followed the retreating troops, simply surrounded and cut off the city. There were a number of efforts to relieve the siege at Kut, and to free Will and his fellow soldiers. British forces in Mesopotamia had grown with the arrival of the 3rd (Lahore), 7th (Meerut) and 13th (Western) Divisions which were ordered to advance north along the Tigris to relieve Kut. They ran into fierce opposition but managed to get close. Then, on 29 April 1916, after a siege lasting almost five months, Townshend surrendered the garrison, and its 11,800 British and Indian troops, to the Turks. The following month, Datchet Parish Magazine published the following: “Prisoners of War. Gunner William Poole (Wilton Cottages) 82nd Battery, RFA, who was with the gallant General Townshend during the siege of Kut, belongs to a family which has responded well to the cause.” This last comment refers to the three Poole brothers fighting in WWI. Sidney, Stanley and Will were all listed on Datchet’s War Roll. This news gave the family false hope. They were later to learn that Will had died on 26 August 1916. He had survived nearly four months in the most appalling conditions as a prisoner of war. William Poole is remembered in Datchet and on the Basra Memorial which commemorates more than 40,500 members of the Commonwealth forces who died in the operations in Mesopotamia and whose graves are not known. Until 1997 the Basra Memorial was located on the main quay of the naval dockyard at Maqil, on the west bank of the Shatt-al-Arab, about eight kilometres north of Basra. The Commonwealth War Graves Commission website explains that “Because of the sensitivity of the site, the Memorial was moved by presidential decree. The move, carried out by the authorities in Iraq, involved a considerable amount of manpower, transport costs and sheer engineering on their part, and the Memorial has been re-erected in its entirety. The Basra Memorial is now located 32 kilometres along the road to Nasiriyah, in the middle of what was a major battleground during the first Gulf War. In December 1914, Datchet Parish Magazine reported that Stanley Poole, a Lance-Corporal in the 9th Lancers had been promoted to Sergeant, and that Sidney Poole was promoted to Quarter-Master Sergant, Natal Light Horse. In April 1917, the magazine announced that Stanley was granted a commission in the 11th Royal Sussex Regiment. Both men survived the war. Strangely, perhaps, there is no mention of their brother Ernest on the war roll.